What About the Other Calls? Overnight articles from the Washington Post and New York Times report that National Security Advisor Michael Flynn did more than speak to Russian Ambassador Sergey I. Kislyak the day before then-President Obama imposed a series of punitive sanctions on Russia. We knew that. He also appears to have lied when he claimed that he didn’t discuss those sanctions. Not only he but also Vice President Pence – apparently conveying Flynn’s denial – denied this. Both papers have multiple sources who say this is not true. Flynn told Kislyak that anything that Obama could do could be undone by Trump in a matter of weeks. Hold tight, Flynn apparently insinuated. Help was on the way. Published reports also suggest Flynn may have violated the Logan Act, which bars private citizens from carrying on unauthorized diplomacy with foreign powers. But I think this specific legal question is a distraction. The Logan Act is seldom enforced and possibly unenforceable – all the more so with an incoming top national security official who is not simply an ordinary private citizen. Indeed, I don’t think it’s the lying or even the late December calls themselves that are the biggest part of these new revelations. To me, though, the even bigger story is one buried a few paragraphs down in the Times story. Let’s step back and piece this together. The sanctions President Obama imposed were in retaliation for what the US government claimed were Russian efforts to subvert the US presidential election on behalf of now-President Trump. It is not unheard for foreign policy hands on the periphery of a presidential campaign to meet informally with foreign diplomats to discuss the generalities of a presidential candidate’s views – especially for allied governments. But this suggests that during the time the hacking and release of documents was taking place and certainly when claimed Russian involvement had become a major campaign issue in itself, Flynn was holding on-going communications with the Russian Ambassador. Flynn wasn’t just vaguely tied to the Trump campaign. He was his top foreign policy advisor and indeed a regular fixture with him on the campaign trail, often appearing with him at campaign rallies. 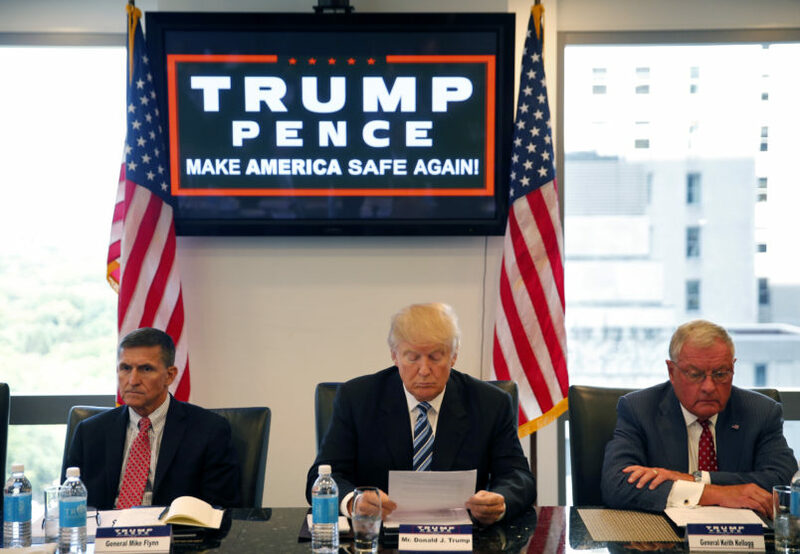 Flynn also accompanied Trump when he received his first intelligence briefing as Republican nominee on August 17th. Again, let’s piece this together. Did the subject of the hacking come up in those conversations with Kislyak? Another question comes up. There were numerous instance during the campaign in which discredited and clearly false Russian propaganda ended up in statements or interviews from top Trump campaign leaders, including but not limited to Flynn. A number came from Manafort too. At the time I thought it was most likely that they picked these up through alt-right Twitter streams and Breitbart, both of which were ready channels for Russian propaganda from sources like RT and Sputniknews. If that was what you were immersed in you’d likely hear these fake stories reported as news. I still think that’s the most likely explanation. But perhaps it’s not the only one. When we look at the big picture, these pre-election back channel communications seem considerably more significant than the post-election ones.